These Stainless Steel Cutlery Sets are oh so handy, not to mention entirely classy! 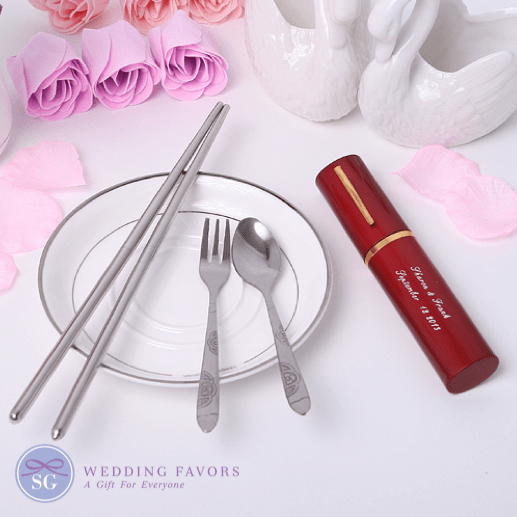 Your guests will truly appreciate these cutlery sets smartly packaged in compact cases with three colors to choose from. Case measures approximately 15cm high x 2.5cm wide x 2cm deep. Do contact us should you require non-personalized versions immediately! Personalization Option: Make it extra special by engraving your message, names and date; or even an image on the front of the cutlery cases to keep! - For images, please contact us and we shall assist you.